Should Radiologists Switch to Flat-rate Prices? As the world of health care grows in complexity, costs increase for providers as they try to cope with multiple fee schedules. “Keep it simple, stupid!” also known as KISS helps simplify running a radiology office. One area where simplicity may pay big dividends is in the pricing model radiology practices, and all providers accepting insurance, Medicare and Medicaid, use for pricing. 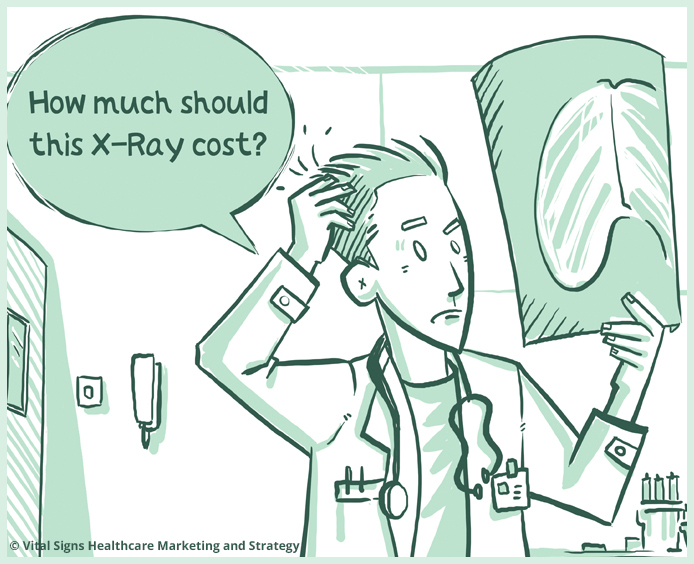 Radiology is perhaps the simplest specialty for changing to flat-rate pricing. Flat-rate pricing in radiology is where you post your fees and whomever pays the bill is never charged more than the posted price. It also becomes a marketing tool. People across the globe buy cars online so why aren’t radiologists getting in on this competitive edge by posting prices online and allowing for a patient to make an appointment too? Northwest Radiology in Indianapolis, Indiana has gone to flat-rate pricing for medical procedures. They posted their prices online with a guarantee that no matter what insurance you have, the maximum bill never exceeds the posted price. This makes for complete transparency in billing for radiology procedures for patients. Not only that, the posted price is all inclusive – it is bundled which means that everything associated with the test is covered by the flat-rate fee. Patients with deductibles still apply the flat-rate they pay out of pocket to their deductible. Flat pay eliminates the need for coding to insurers based on a contract price, and then billing private-pay patients based on another fee schedule – now it is one fee that is the same for everyone. In fact, for some insurance companies their allowable charge is more than the posted price, but they are billed the posted and not the allowable which saves them and patients money. He explained that Northwest radiology charges the lower of contract rate or flat-rate pricing. He further explained that many of the folks covered under the Affordable Care Act have high deductible plans and calls were endless from patients he wanted to serve in regards to price. His staff had to look up the contract price with a particular insurance for a particular plan, and then find the deductible for the particular procedure code for the patient’s insurance company’s contracted price. Now there are just 12 prices for everyone, even if an insurance contract price is higher. Simple. The group of 50 radiologists created just 12 categories with a single flat-fee for each type of procedure. Pricing is based upon the type of procedure and not on the body part. The Northwest Radiology group is not alone in going to flat-rate pricing, there are others. In fact, according to the Indianapolis Business Journal there are more than 4,400 direct-care physician practices that use some kind of flat-rate pricing. This company is a provider of imaging and lab testing and in February of 2015 switched both services to flat-fee pricing. “Patients don’t understand what a test can cost them. We’re making it really easy. It’s the patient’s right to know what they have to pay.” In addition, private patients get an additional 25 percent off if payment for X-rays are complete before testing. SmartChoice MRI has five locations in Wisconsin. It is one of the first MRI providers offering flat-rate MRI pricing. At SmartChoice all MRI exams are $600. The fee includes the technology, the technologist and the interpretation of the exam by one of the 16 expert radiologists at the Cleveland Clinic. Turnaround time for interpretation is less than 24 hours and often done in under six hours. The company claims to have contracts with all major insurance companies writing health insurance in Wisconsin. Because flat-rate pricing uses an average of insurance contract rates, higher contract payers get a discount, but it really isn’t that great as the negotiated rate usually is close to the flat – rate. Lower overhead – coding for 12 fees and one price is less costly than coding for hundreds of procedures and then billing for the technical and professional component. Reputation Improvement – published flat-rate show patients and insurance companies that a radiology practice works to make high-quality radiology more affordable regardless of payment source. Conversion to ICD-10 – will be much simpler using flat-rate billing as only 12 codes will be affected, not hundreds. Patient satisfaction – Instead of charging uninsured patients or patients with high deductible policies, the “street-price” of a radiology procedure (which is often higher than insurance fees) the flat-rate fee is prominently posted on the wall and websites. This gives a radiology practice a competitive edge. There are indirect benefits as well. With leaders in the field of radiology leading the way with flat-rate pricing, other providers are exploring how to do it too. This means removing a lot of bureaucracy and its attendant costs from the health care delivery system in the United States. Radiology practices that offer flat-rate pricing are consumer conscious and make the process as simple as possible by using patient-centric technology to improve the online experience. Patients use patient portals to make appointments, fill out forms, pay bills and much more. While improving the patient experience overhead costs plummet as more patients use the portal. The result is less back office staff. Many medical providers and suppliers of goods and services all over the world embrace flat-rate pricing. In fact, many “concierge doctors” in the United States, Canada, the United Kingdom and more have been using flat-rate pricing for years. Is Flat-rate Pricing the Future of Health Care? No one knows for sure, but it seems that for specialties including radiology, flat-rate pricing may begin making strong inroads at the expense of charging by image location or a legacy billing process that charges according to payer and/or allowable. The benefits appear to have few downsides for radiology practices, patients and insurance providers. Since we use the comments as a forum for radiology practices and suppliers to learn from one another, please share your experience, comments and concerns on the comment form below.